I peek to see if Momma is still there, she is, I snuggle down in what Momma calls “your stroller” it is my special place and I love it. Momma changes the padding every night and it is all soft with cotton. I close my eyes listening to the sounds of Home while Momma makes soft sounds in her sleep assuring me all is well I drift back to sleep, remembering the first time I ever saw her……. As the door opens I drag myself as fast as I can helped along with a set of wheels. The woman looks me directly in the eye as she says “baby boy, you are mine now”. I am a little nervous as we ride in a car then the woman carries me through a door and says to me “baby boy, we are home”. I pick up the scent of a dog as the woman says “Adie this is your new brother” I do not know what a brother is but, from the sound in the woman’s voice it must be good. Adie seems sort of snooty and my guess is, not at all glad to have a baby brother. She circles me sniffing from a distance. The woman says “Adie be nice” Adie raises her nose in the air, jumps on the sofa and lies down with a snort. Of course I have never seen a sofa or a swimming pool or had my own bowl or the glorious new things the woman calls “toys” but I am learning very fast. It is dark now and everything is strange, the sounds in the house, the smells. Every time the woman touches me it is soft and when she scratches my ears I feel a warm sensation through my body. She reaches for me and says “Momma loves you, Baby Boy”. Momma gives me a bath and now I smell like flowers which I don’t like, but Momma seems to enjoy it because she snuggles me and rubs my ears “you are a clean boy” she says nuzzling her nose against my skin. Every morning a man comes through the door and Momma says “Alejandro is here”, Adie gets very excited barking and jumping around, so I decide I will do the same except when I get excited I pee. Alejandro comes outside to say hello, first he say’s “Adie Cookie?” Adie seems to like cookies because she sits and lifts her paw to shake Alejandro’s hand. Then he offers me a cookie, cookies smell delicious, so I take it from his hand. Sometimes I sense empathy and patience from Momma. She sits me on the counter which is another of my special places. I know it is special because Momma rubs my ears and talks very sweet to me. There is something in my special place I do not like, water and the soap that smells like flowers. Yuk! A basket holds assorted things to bandage my legs. Momma places everything in front of my nose for me to inspect. She softly reassures me as she dots cream on my legs where I have no hair or skin then she bandages my legs. When she is finished she sits me on the floor and I am free to go explore. I drag myself around feebly attempting to mark my territory on my expedition; I am embarrassed as Adie watches me dribble pee on my newly bandaged legs, she struts off with her nose in the air. I pull myself along with my strong front legs, I let out a yelp as I catch up to her, she jumps onto the sofa putting as much distance between us as possible because she knows I cannot jump. I am a puppy and my gums hurt, I decide to chew on a rock. Momma places a bone in front of me; bones are much tastier than rocks. Momma tells Adie and me to sit; I try to be very good like Adie. I know Momma has a Pup-A-Roni so I start to wiggle over to her even though she told me to “Stay”. Momma is very patient and tells me “Sit-Stay” I try not to wriggle until Momma says “Come Rico” then as fast as I can I drag myself over to her out reached hand to gobble the delicious tidbit as she says “good boy Rico”. I have learned that I am a good boy and my name is Rico. Sometimes, Momma calls me Ric-o-Roni. Adie gets very happy when Momma says “Daddy is coming home” I do not know what a Daddy is….. Then I hear someone come through the door snooty Adie makes a complete fool of herself, jumping, snorting, and twisting every which way. I drag myself as quick as I can to see this new man… So this is a Daddy! He reaches down with his large hand and gives me a gentle rub under my chin. I am excited to meet him, so I pee. One morning Momma and Daddy are busy, Momma puts me on my special counter and a terrible thing happens, she washes every inch of my body even my ears. I do not like it one bit so I poop in the water. She says “oh, Baby Boy” and proceeds to bath me all over again. There is a good part to having a bath, when Momma is finished she wraps me in a dry towel and holds me close gently rubbing every inch of me. It feels so good, I snuggle my nose to her chest as she looks me straight in the eye drops her face to mine and says “Rico, I love you, Baby Boy”! I close my eyes and let my body go limp, I am safe and I am secure even if I do smell like flowers. Daddy says “let’s go” Momma holds me securely in her arms as we walk through the front door. I raise my nose in the air to take in all the new smells. Momma places me in a soft comfortable seat with my favorite toy “Teddy Bear”. I like the seat; I can see out the windows as Daddy drives, I see a lot of people and cars, but I do not see any other dogs in car seats. The motion in the car makes me sleepy and since I am clean and have my Teddy Bear, I decide to sleep even though I smell like flowers. We go to another of my special places. Momma says “Patricia is my Physical Therapist”. I sense so much love and gentleness from Patricia. Because she is so sweet, I lie very still and let her rub me all over, I let her rub me until she is tired of rubbing, then Momma takes me home and I nap. Every night Momma washes me and places me in my stroller, as she rubs me and places a kiss on top of my head, she says “here is your Teddy Bear, good night sweet boy” I give her hand a lick. She rolls me beside her bed. I hear her ask “Adie you want Momma to put you on the bed”? Adie can still be a little snooty as she eyes me from her pillow. Momma says “night Baby Girl, night Baby Boy”. As she turns off the light I snuggle into position so I can see Momma and check on her during the night. In the mornings Momma sits a bowl mounded with the most delicious food in front of me. Adie gets a bowl too. I eat all of mine then I help Adie eat hers. When all of the food is gone I spend a long time helping Momma by licking the bowls clean. My bones no longer poke out, making it much more comfortable to lie down on the cool concrete. When Daddy is home he slips me and Adie little treats of food from his plate. Daddies are the best! One day Momma is very upset, I can sense her sorrow. I can smell the salt on her cheek. She and Daddy are talking to Dr. Tony. In the car Momma and Daddy talk, I feel their sadness. Daddy reaches over to touch her hand and then pats my head. At home that day Momma is sad so I sit in her lap as much as she needs me too, I let her scratch my ears, because it makes her feel better. I rest my head on her arm; I look into her eyes to let her know how much I love her. Momma, Adie and I are up early, which I like because Momma holds me and tells me I am a good boy. I hear a knock; I drag myself to the door as Dr. Tony steps inside. I am excited to see Dr. Tony again and decide to chew on the hem of his pants. I sense sadness in Momma, a deep and mournful sad as she scoops me into her arms and gently places me on the bed, she crawls onto the bed beside me for a good snuggle. She brings her face to mine and kisses the top of my head; I wiggle and lick the tip of her nose to let her know she is a good Momma. I feel her heart beat; I smell the salty wet .I feel her love and grief as she says “Rico you are a good boy”. Dr. Tony is very gentle when I feel a prick on my thigh. I look into Momma’s eyes and I know she loves me. I smell the trees and the flowers, I watch as a leaf slowly floats through the air, I jump to catch it in my mouth and toss it back into the air. I am so happy, following the trail through the woods, sniffing and lifting my back leg on every bush to mark my territory; I chase an iguana until he disappears into a hollow log. It is a bright and beautiful day; in my heart, I hear Momma say “run Rico, run and play”! So I do, I run like the wind! 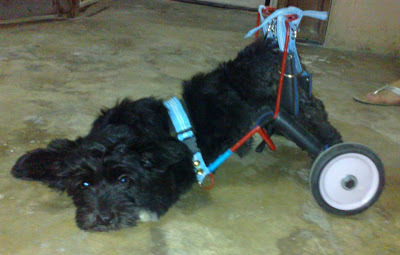 Rico was the little dog in the wheelchair, both hind legs twisted and unusable from birth. He did not see his handicap and would drag himself playing with toys and chasing our Schnauzer, Adie. He struggled to do ordinary dog things, but always seemed to have a smile on his sweet face. He was a little guy but huge in spirit and touched everyone he met with his special brand of charm. He was abandoned by his first family, and rescued by a local shelter that was smitten by the little guy, but struggled to provide the care Rico needed. We were told he was probably unadoptable, he was at the bottom of the barrel, but this little dog captured our hearts and changed our lives forever. Through Rico’s challenges which sadly he was unable to overcome we recognized a need in Yucatan to help Special Needs Dogs. The little unadoptable dog in a wheelchair found his “Forever Home” and will live in our hearts forever. He will always be remembered through Amigos de Rico Memorial Foundation and our hope is countless dogs and their families will find help through the generosity of the donors and volunteers. What a lovely tribute to Rico. Hugs to Mommy and Daddy. Thanks Barb, He was a very special little dog that changed our lives forever. Heart wrenching. You gave Rico a wonderful home for his brief life. Thank you for sharing this with all of us. Wow, so wonderful to have met you and heard stories about this sweet dog! thank you for coming forward.. we all want the best.. there are many offers to help them change.. The supporters should demand change, realize we are not attacking.. we want to help improve. - Things have to change.. Thank you for all you have and still do for animal welfare.. Thanks Amy, it is nice to have your support.